show off your stuff in style. While #shelfies will probably never surpass #selfies, a girl can dream, right? The trend of photographing the contents of your shelves started in the bathroom (thank you, ITG), but with the rise in popularity of open shelving in the kitchen, we’re happy to announce the #shelfie movement has officially relocated. As if you need incentive to curate the perfect mismatched dish collection, the time is now. Have a #shelfie you’re proud of? Tag #SOdomino! We want to see. The chic combo of this gray, marble tile and minimalist white shelves and dishes is an easy way to dip your toes into the art of shelfie-ing. Bonus points for arranging your floating shelves beneath a glam chandelier. The light pastel dishes (with gold foil accents) paired with the light wood feels cute and kitschy, but also regal and sophisticated. Can you even imagine hosting guests at this outdoor bar? The blue and green color palette pairs perfectly with the tile and overall feel of the space. It would be a crime to keep this dish collection hidden behind cabinet doors. The wire baskets and vintage radio add so much to this already modern kitchen. Though kitchen shelves are mainly used for utility, there’s no reason you can’t add a few decorative touches, like a plant or print. Most open shelving seen in kitchens are comprised of floating shelves, but not here. If custom shelving is more your style—or you just want to rip off your cabinet doors—this is a prime example of how to do it RIGHT. Preferring to keep your closed door cabinets is your prerogative. If you want to get in on the #shelfie fun, simply add a smaller unit to a wall in or near your kitchen. The stainless steel appliances, accents, AND shelves in this kitchen are so sleek. We also love the canisters lined up underneath. These shelves are unique, because they not only add visual interest, but also additional shelf storage—and the opportunity to play with some fun spacing and arrangements. Painting the wall behind your long, floating shelves is just another way to make your dishes stand out in a neutral space. Every kitchen should have a tiny, open nook for cookbooks! And those mug hooks? This kitchen shows how chic, practical storage is done. This neutral shelfie is a great example of how it’s important to style your home with textures, colors, and pieces you love. These shelves look like they were a lot of fun to style. Do you see how the wood is carried from the kitchen counter all the way to the top shelf? And the mason jars split on two levels? That creates a gorgeous continuity that lends to the overall feel of the room. The rustic qualities of this kitchen don’t stop it from feeling chic. If trendy, white marble isn’t for you, you can definitely still get in on the shelfie fun. This kitchen features traditional design elements, but still has a modern feel, which has a lot to do with the shelves. Again, notice how the copper and stainless steel (or silver) accents and black and white photo frames are scattered throughout the kitchen. This all-white kitchen with gold hardware and pretty pastel dishes is so feminine and chic. And it’s a great reminder that canisters of candy are always welcome. This shelfie reminds us that you don’t have to display all your dishes—just the ones you want! Be selective and the result will be an incredibly curated look. If you’re someone who enjoys entertaining (and hosts parties often), you most likely have an impressive collection of serving platters and pitchers alike. Displaying them all in one place is a fun way to show off your dishware on those rare nights you’re not arranging a get-together. There is SO much going on in this shelfie—which is not a bad thing. Adding personal touches like prints, flowers, and funny mugs is encouraged! Just make sure to create a color scheme so your shelves don’t end up looking unorganized. We’re not quite sure how these shelves were installed over glass, but that doesn’t mean we don’t love them. With all our hearts. 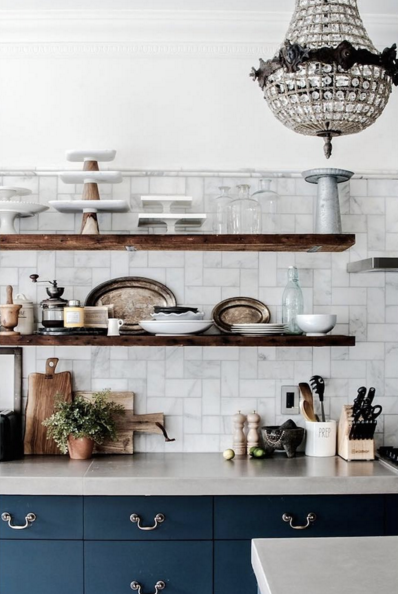 These black and wood shelves are the main attraction in an otherwise white kitchen. This shelfie is another reminder not to limit your shelves to just dishes or decorative items. Displaying things like canisters of spices and baking supplies next to cookbooks is always an option. This kitchen is the epitome of minimalist chic. From the matte white sink head to the simple design of the dishes, this shelfie nails it.